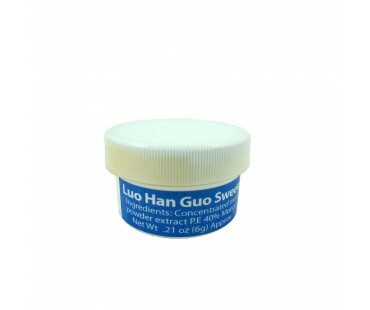 100% pure Luo Han Guo sweetener with ZERO carbs. 250 times sweeter than sugar. This is uncut and concentrated Luo Han Guo Monk Fruit, before the ingredient companies add all their bulk filler of sugar and fiber to thin it out and cut it's purity. Use Luo Han Guo sweetener to make your own all natural sweetener blends or syrups, or to use in baking or beverage recipes. I like this product, and use it now instead of stevia. To measure, I use the little scoop that came in a bottle of Trader Joe organic stevia -- the scoop is tiny and so, perfect for adding this concentrated powder. I really like this product. I make my own chocolate fudge and use only this to sweeten it with. It doesn't take much and lasts a long time. Really cuts out the sugar in my diet!! Wonderful stuff! I am giving this a rating of one star just because of the quantity sold at that price. How do you measure this for recipes? Hard to use because its pure luo han guo and not a mix. Very Strong! I love this stuff. I add it to my drinks, such as steamed latte and iced tea.